Sunday Morning, before I managed to secure a truck to move some furniture from old house to new house, I decided to do some final yard work at the Brookline house. Mowing the back yard, I notice a bunch of insects flying around one area. I stop and take a long look to assess the situation. 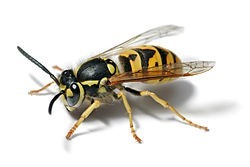 It appeared to be yellow jackets swarming around an area that I just mowed, and one flew in my face to confirm my original assessment. after swatting the annoyance from my personal space to the ground, I looked down in order to crush the fucker with my foot. This is when I got a little startled. 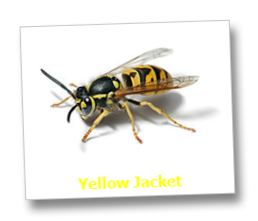 Both pant legs of my jeans were covered in yellow jackets, which all appeared to be gnawing and digging into the denim. I quickly thought “ok, just take the damn pants off!” but then decided that was a bad idea. I didn’t want to get in some sort of trouble for running around naked in broad daylight, or jeopardize the safety of Lil Dustin. I managed to pretty much keep my cool, and walked around to the front of the house, swatting and crushing the little fuckers off my pants. Counted a total of somewhere around 20 dead ones in my driveway and sidewalk alone. Several hours later, I return to the back yard, armed with a can of wasp/hornet spray. In an attempt to stay protected, I dressed in a black hoodie with motorcycle glasses, baseball hat, black bandana covering my forehead and ears, and a pink camo bandana covering my face… So I had to look pretty damn gangsta. For added backup, I had Fat Skinny behind me armed with another can of wasp spray and a broom, just in case. We unloaded and unleashed hell on the nest and all attacking yellow jackets. After we unloaded, we ran into the basement. Fat skinny, being extra cautious, slammed the door shut, then locked the deadbolt, and let out a sigh of relief. I guess he thought the yellow jackets can open doors. the aftermath: not a single yellow jacket bite/sting/whatever. And a whole lot of dead yellow jackets. success!